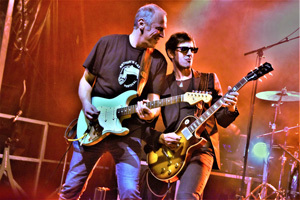 Baptiste Vayer and Alain Carminati, two Beauvaisien guitarists known to fans of live music in the region, form the duo Mister & Mister. They perform music, without unnecessary overload that goes straight to the point with sharp sounds .There is careful and professional implementation. You will love the wild rhythms that accompany a tonal voice drawn from the crooners. Not to mention the essence and madness of rock, the spirit of soul and the feeling of blues. Guitars, voice and drums ... This is the program that will captivate you.